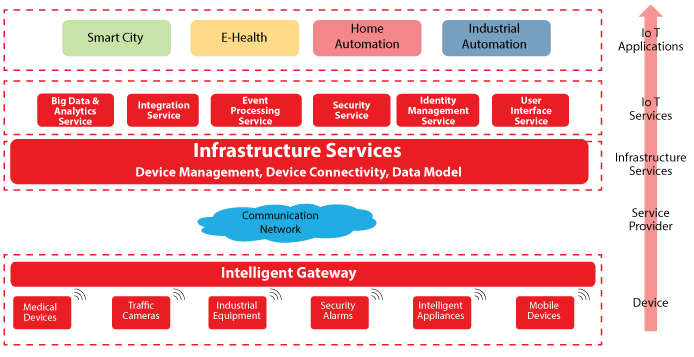 To understand the features and connotations of the IoT, it has been structured into a five-layered architecture format. At the bottom is the Device layer which is the main data source and includes sensing devices that are capable of sensing the surrounding environment, collect data, and transmit it on regular intervals. These sensors need to interact with the intelligent gateway which provides data aggregator and device level data processing capabilities. Data is transmitted over the network through a service provider. The next layer enables the seamless connectivity with different Machine to Machine (M2M) devices, and offers remote monitoring and managing of device connectivity. • IoT Protocols– The next wave of Internet, or IoT is about intelligent, connected devices, supporting hundreds of protocols for successful interaction. These devices communicate with each other (D2D) and data collected from this communication is sent to the server infrastructure (D2S), which then shares the device data (S2S). The data can be provided back to the devices, people, or analysis programs. IoT system can be built on familiar Web technologies, however, the result will not be as efficient as with the new protocols as IoT protocols must produce smaller data overheads, and should be optimized for constrained devices and networks. MQTT, DDS, XMPP and AMQP protocols are gaining popularity, however, there are at least 10 implementations of each, and hence confusion is inevitable. As a result, despite set standards, adoptability has been slow, and many different protocols are being used due to business and technological limitations. There are however several standardization groups and bodies that are actively working to create more inter-operable protocol stacks and open standards for IoT. • Security– When millions of smart devices are inter-connected, there is a continuous flow of data, travelling between devices, networks, and gateways. IoT is opening the networks that were previously closed, making them more vulnerable to the hackers. Whether in motion, or at rest, data security must be ensured. Most gadgets these days lack the basic protection against hacking, and vendors need to come up with smart solutions. Operators can employ stricter encryption standards that are scalable, efficient and affordable. Another challenge is to educate consumers to utilize security features built into their devices, and users need to keep updating their devices regularly. For end users, security procedures cannot be too complicated, yet they should provide sufficient privacy and protection. • Privacy– With growing number of connected devices, IoT will generate and store more and more personal information, which will be very attractive for the hackers, leading to more security breaches. Due to the recent NSA revelations, people and organizations are becoming more conscious about maintaining their privacy, and this is affecting the way they are storing the information. To enable development of IoT, international alignment on privacy rules is required. Different countries have different privacy policies when it comes to grasping personal data, and if this alignment is not made, companies will have to choose their selective markets, instead of providing their services all around the world. • Data Flood-Undoubtedly, IoT will be generating unimaginable amount of data, and existing infrastructure in terms of wireless carriers to the data-centre is inadequate to handle such enormous data volumes. Additionally, this data needs to be processed and stored, resulting in huge infrastructure and maintenance cost. To facilitate data storage, bigger data centers and data farms need to be established, and this will require large investments. • IPv6 adoption– IoT involves billions of devices, and hence requires billions of new IP addresses. Although we will run out of IPv4 addresses soon, still the adoption of IPv6 is not growing as fast as required and 2013 saw a decline of IPv6 traffic. • Analytics– To deal with the data, enterprises will have to think beyond conventional business intelligence tools. As an example, in case of medical emergency, the data received from the monitoring devices needs to be analyzed real-time. This data then needs to be stored and reused so that patient care can be improved based on his or her medical history over the past few months. In IoT, data will come in smaller pieces which will not overload the bandwidth, and we can throw away the data which is not required. However, we need to have mechanisms in place to collect only relevant data that is useful for analytics and semantics, and filter the irrelevant data. • Fragmentation– IoT is a complex interconnection of software and hardware working together, creating a platform of the developers and organizations. Due to this vertical platform, the existing M2M related standards and technological landscape have become highly fragmented, which can be seen across several applied domains with almost no re-use of technologies. Each IoT device is installed in its own platform and ecosystem, and companies have become more interested in owning the vertical stack rather than developing products and services to benefit developers and consumers. Open source platform will encourage the collaboration and creativity, and will also help reduce the cost of product development. The entire ecosystem of users and solution providers will benefit by striving towards use of common set of tools, leading to less fragmentation. • Interoperability– IoT requires connecting heterogeneous objects amongst themselves and also with the Internet. The people have been connected anywhere, anytime, and now the next step is to interconnect heterogeneous applications and services that can be integrated with existing and new processes. Interoperability is extremely important and challenging in IoT which requires effective and efficient management of resources. The future networks of IoT will continue to be multi-services, multi-vendors and largely distributed, which will increase the risk of interoperability. The lack of such interoperability could lead to loss of some key information or unavailability of some services for the users, unless standards are set both between and within domains. • Quality of Service (QoS)– Quality of the service is the idea that error rates, transmission rates and other factors can be captured and improved. As IoT is inherently a complex shared system with integrated plethora of network components, applications and resources, there are many dynamic and heterogeneous constraints in terms of communication, computation and energy. IoT applications must have a robust and expressive set of abstractions to consider these multiple dimensions of QoS. In the network, the applications interact, and multi-dimensional QoS requires active compliance with both sides of communication and the network There must be a balance in the demands of different parties (resources, applications, intermediate network) in a highly dynamic, unpredictable and diverse network of IoT. 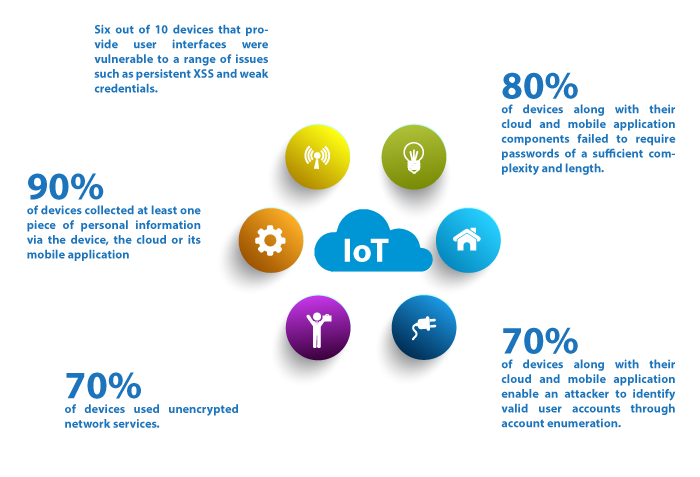 • Deployment challenges –IoT encompasses a wide range of devices, wearables and embedded technologies. There are staggering possibilities with numerous algorithms and schemes that can possibly create a mesh of deployment complexities. This poses significant challenge to the application developers, as they have to cope with the exceptionally large number of supported devices and form factors, and extensive network compatibility issues in order to make front and backend more responsive. Developers also have to deal with the highly capable edge devices. Additionally, they have to capture, process and support business requirements from the data generated by all these devices. • Lack of Common Standards– Within the IoT space, the lack of open standards is manifested at the institutional level. As an example, Internet Engineering Task Force (IETF) involves multiple stakeholders and policy makers including engineers who help formulate framework for the development of Internet. However, there is no such establishment for IoT. Such standards are required for IoT growth, and first step towards open standards could be well-documented APIs. • Complexity-IoT technology will connect equipment and devices that have never been connected before, and hence, there must be ease in the design and development to have more connections. The technologies required to create intelligent systems can get extremely complex and broad, and to provide seamless experience, the solutions need to be customized to some extent. • Power Management– The things in IoT will have to be portable and self-sustaining to be more energy efficient, and hence adding power management to these equipment needs to be made easier. For future development of IoT, unconventional power sources must be tapped. Devices in IoT have to handle several different tasks. The biggest question however still remains: Do we really need or want all these connected devices? Would we buy more devices because they connect? And discard the existing devices? Do people really need self-driving car, or a connected tennis racket to improve the game? Some people feel that IoT is much hyped at this stage by the companies who are designing services and equipment for it. Only future will tell how different devices connect, and if they hold the potential as promised. IoT comes with technological, business and societal challenges, and we need to ensure that this internet wave breaks smoothly on our beaches.